Spring is a great time to reseed or plant a new section of lawn. You want to mow as the grass grows but don’t want to upset the dirt and fertilizer. You also don’t want the rotary mower action of sucking up dirt and seeds. We have found the Brill Razorcut Reel Mowers are the best mower to use on newly seeded lawns and first few cuts. Because of their light weight, the Brill Razorcut does little damage to the ground. You can push them over the newly seeded or planted areas and the ground is not harmed. If you mow using the Brill Razorcut 38 or 33 without the Grass Catcher, the grass clippings will help fertilize the area and even hide the seeds from the birds. The Walkover Sprayers are in the container and making the voyage across the Atlantic Ocean. It is expected that the lawn and turf sprayers will be in our warehouse by March 20, 2009. The container has both the Walkover Greenkeeper Sprayer and the Walkover Rambler Sprayer on board. The Greenkeeper is a four wheeled sprayer with three nozzles. 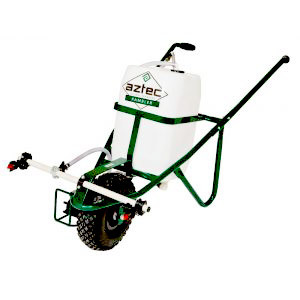 The Rambler has two sprayers and one large wheel and rolls like a wheelbarrow. With both sprayers, as you walk and the wheels spin, the sprayers spray. Off course you can shut the spray off when you desire. The Greenkeeper sprayer can be seen next week at the Turf Show in Providence, R.I. March 2-5. Made to replace the Sunlawn MM2, we have just learned that the new 2009 Sunlawn’s Classic Reel Lawn Mower has a height cutting range of 1″ to 3 3/4“. This makes it the mower for folks who want to leave their grass longer. Customarily reel mowers have a top range of 2”To compare specs on all the Sunlawns side-by-side, check out this chart. The other new 2009 Sunlawn model, the Ideal reel mower, will have cutting heights to 3″. This mower cuts a bit lower than the Sunlawn Classic and has no back rollers. Possibly a Reel Mower for Bermuda Grass Which Won’t Break the Bank? We might have great news for folks with Bermuda Grass. Until now, if you wanted to mow Bermuda Grass with a reel lawn mower, you had to spend thousands of dollars. We have just learned that the new Sunlawn Ideal mowers will cut Bermuda Grass. The redesigned and re-engineered Sunlawn reel mowers have a 10 inch rubber wheels. The Ideal reel mowers cut from .5″ to 2″. The image below is all we have at this time. We’ll update with better photos as soon as we receive them. Turf Show: People Powered Machines will have a booth at the New England Turf Grass Show in Providence, RI. The show runs from March 2 to March 4. Superintendents: The Turf Show is a popular show for Golf Superintendents. People Powered Machines will be introducing the Walkover Greenkeeper Sprayer at the show. The high quality sprayer should be a coveted piece of equipment for golf maintenance folks. Ecopod to Mode: For a few years we successfully sold a product called the Ecopod. It was designed by BMW and customers loved this product. Then the distributor just disappeared and we could never reach them again. After 2 years, we are thrilled to have found an even better, more sturdy product at a lower cost, the Mode recycling units. Mode Offers Three Units: Mode Products offers three units. The top of the line is stainless steel. Next in line is made from painted plastic. The next does not offer the electric measuring device. Bottle and Can Crusher: These units come with a bottle and can crusher which dramatically shrinks your waste. The units also come with a compartment for paper and magazines. For those wishing to lessen their waste and keep bottles, cans, paper, and magazines organized in one place, the Mode is here. Sort. Store. And crush your way to a cleaner counter top. The Mode™ Premium All-In-One Recycling Center, featuring our patent-pending compaction system. The Walkover Sprayer: The Greenkeeper Walkover Sprayer is a wonderful machine hand made in the UK. As you push the sprayer the wheels drive a pump which sprays. 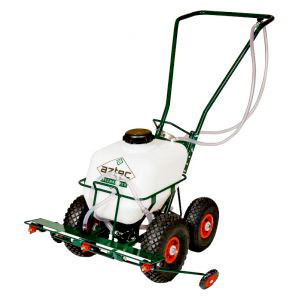 The sprayer is ideal for golf courses, tennis courts, and any athletic fields in which turf care is required. Minimal Drift: The Greenkeeper Walkover Sprayer nozzles are mounted on the sprayer just 5″ above ground. This provides an accurate spray with minimal spray drift. Most commercial & knapsack sprayers spray from around 3 ft height & cause major problems with spray drift, particularly in populated areas ( asthmatic effects ), but also dangerous for the operators. 2 Nozzles: The Greenkeeper uses 2 sizes of spray nozzle. Both are supplied with the sprayer. A Red nozzle. The 25litre tank (5 gallons) will give coverage of 600 sq. yards = 5400 sq. feet. A Blue nozzle. Will give coverage of 800 sq. yards = 7200 sq. feet. Nozzle Size: The nozzle sizes are metrically calibrated: red is 200 micron & blue is 150 micron in size.